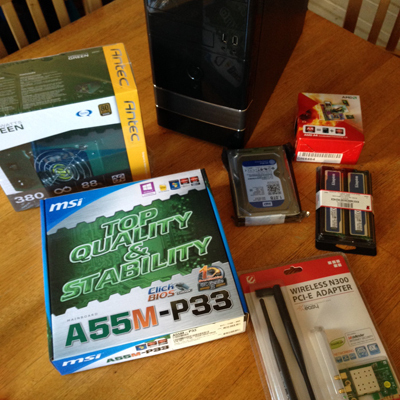 With all of the parts ready, we watched this amazing Lifehacker video once through. Then we replayed it, pausing at each point and following along. It was almost scary in its accuracy and clarity. It took us just over an hour. There really wasn't a hitch along the way. The girls helped keep track of the parts, ran the video and guided the screws into their spots with their little fingers. 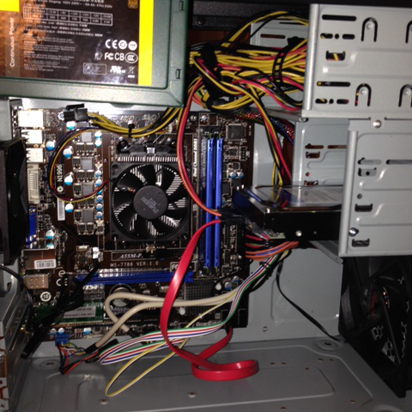 What starts out as a wide-open case gets really crowded. Finally, it was time to power it up. Fortunately, I had one of those old computer power cords buried in a closet -- none came with the power supply. I plugged our new box into the wall and used an old VGA cable to wire the computer the TV. And voila! It even seems to be ready for human input. Buuuut ... my old USB keyboard is under my desk at work. So it'll be tomorrow before I can press F1 to run Setup. Didn't really have the attention of the girls through this part, which took some "boring" work on my part. If you're not actually immersed in the geekery (or trying to make your own computer), feel free to skip to the conclusion in Episode 5. Hitch: Once I hooked up the keyboard, I promptly made a small mistake by pressing F2 instead of F1, thinking I could try the default settings. Wrong! 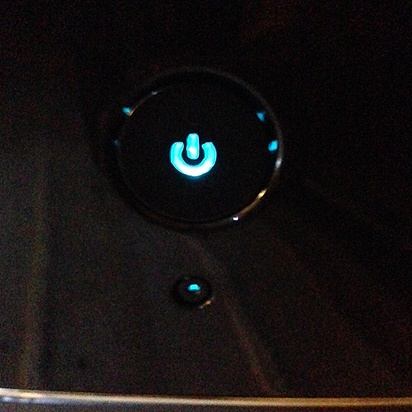 I was stuck looking at "Reboot and select proper boot device." In order to reset things, I learned from this video about "resetting the BIOS." That involved opening up the computer, finding the right pins from the motherboard manual, putting a jumper on the reset pins, starting the computer, shutting it down, and removing the jumper. Whoops! 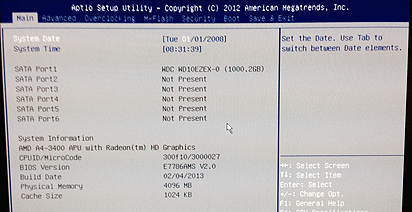 Once back to the BIOS setup screen, I was able edit the settings following along with the Lifehacker lesson. The Lifehacker article goes on to show how to install Windows, but I want to run Ubuntu, a flavor of open-source Linux. I'll install that from a DVD using a USB CD/DVD drive I had kicking around. So the key step here was making that the first boot device. Using my Mac, I learned how to download and burn an Ubuntu install disk. I went with the Ubuntu 12.04 instead of 13, because it seemed more stable and maybe more basic. I then put the Install disk into the USB DVD drive, plugged the drive into a USB port on the new computer, restarted the system and the Ubuntu disk started to work. But then ... nothing. Just a pretty purple screen with nothing else and no mouse cursor. Tip: When you see the little person in a circle as Ubuntu loads, you can hit any key for a very helpful screen. I learned that form this issue/answer page, and also learned how to fix my problem. I tinkered with the "F6 Other Options" as they describe, and kept choosing "Try Ubuntu without installing" to test things out from the DVD. For me, it turned out that I needed to check just the "nomodset" option for everything to work right. Soon, I had a desktop showing, and -- to my surprise -- the wifi card worked without any additional adjustment. Suddenly I was on the internet with our new computer. I used the icon on the desktop to install Ubuntu on the hard drive, which went really well. 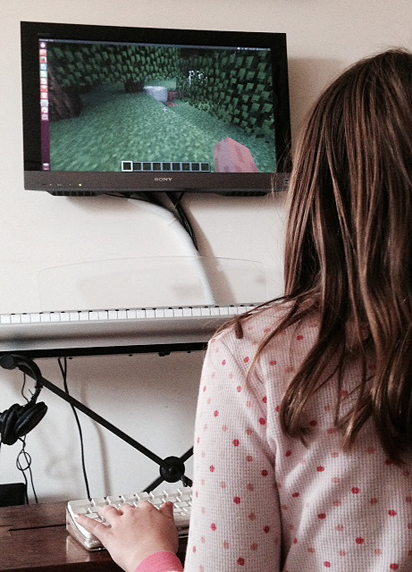 Using the Firefox browser, we went to minecraft.net, logged in and tried the demo. Firefox prompted us to download a couple of Java plugins that turn out to be key to running things later. 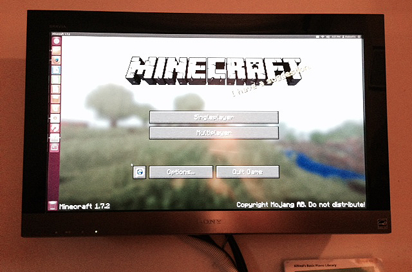 Happy and excited, we went back to the Minecraft site to buy and download the actual program for Linux. We downloaded the application, double-clicked the icon with anticipation and ... nothing. 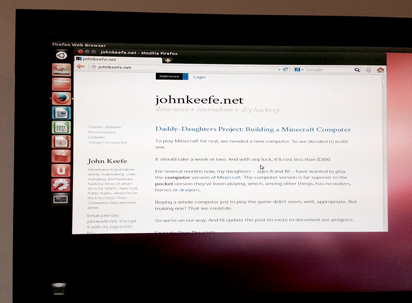 Turns out there are a few final steps necessary to make it work, which I found by Googling "playing minecraft ubuntu." Despite our digital demise, we jumped around with glee. 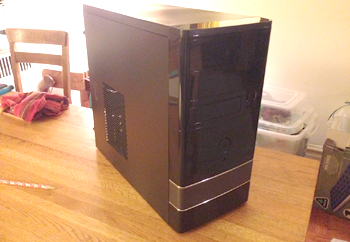 We had built a working Minecraft computer from scratch. My plan is to eventually set up a multi-player server in the Amazon cloud (like this or this), so they can play safely with their friends in the neighborhood. In the meantime, they're pretty thrilled to shear sheep and spawn mooshrooms locally. Oh, and the computer ended up costing $297.20 with all of the shipping and such -- under $300 as planned -- though it counted on the fact we already had a compatible TV, a USB DVD drive, a spare keyboard and some key cables. Minecraft itself cost another $27.69. Still a lot cheaper than buying the system ourselves. And a whole lot more fun. Cool... My kids have really gotten into Minecraft PE also. I been thinking about doing the same thing that you did. Great post. I'll let you know how it turns out. Thanks so much for posting this in one easy "how to " page. 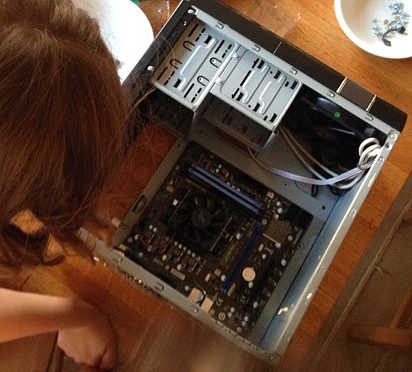 I'm putting our first system together from scratch with my 10 year-old daughter for Christmas this year and I can't wait to see her learning how to do this the way your girls did. I'll plan to update you with some (hopefully) exciting news in the new year. Cheers! I chickened out... I found some toshiba laptops at microcenter... that came out to the right price. So I pulled the trigger. I'll probably steal you specs when we build a desktop.